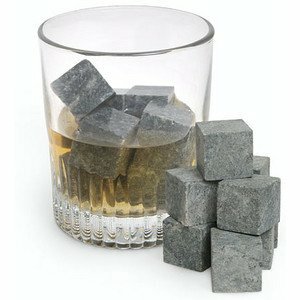 Keep your drink cold without watering it down with these whisky soap stones. A great gift for the hard liquor enthusiasts or just to put in any drink really. 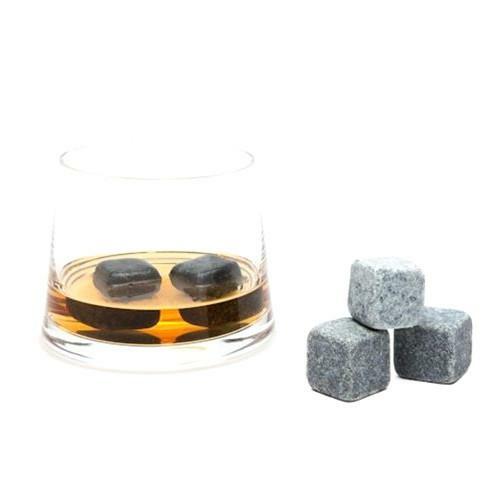 Set of nine stones keep your drink cold. Natural soap stone that is large enough it will not get caught in your throat. As they are stones they will not melt and dilute your drink. After four houses in the freezer they are ready to be used, which is pretty fast really. Clearly the best thing about this is that it cools your drink without diluting it. Its certainly a good idea for people who just hate their drink being watered down. For whisky lovers that have expensive bottles of whisky and so particularly do not want the drink being diluted this makes an obvious and great buy. For others that might want to use them to cool other drinks they work well enough. Its nice that they only take about four hours in the freezer to be ready as well, though that is quite a while. Best of all you do not really have to worry about ice cube trays and they will not stick together. Just throw them in. Personally I enjoy eating the ice cubes, but for people that hate that this makes a great addition tot he kitchen. The truth about this item is that it deserves more positive reviews, the only reason it does not have a higher score on Amazon is because Amazon were at one stage passing a cheaper model of the item off as the same thing. It is certainly a very worrying idea that you will spend money and get a cheap version of the product. Surely something Amazon should respond to more aggressively in future, but this may have been buyer confusion and a mistake as well. The only real actual negative about the item is that it does not cool exactly as well as ice. Its fairly close, though, and will definitely cool down your drink. Perfect for whisky really and given that it does not dilute it at all its definitely a nice product, particularly for those that are quite fussy about the taste of their drinks.